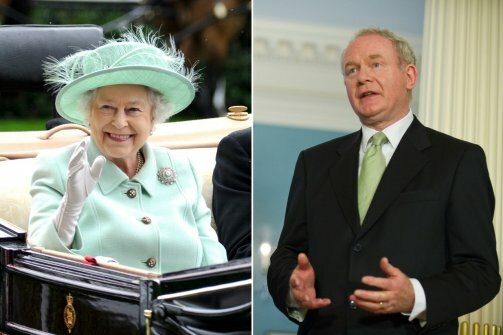 Queen Elizabeth will meet with Martin McGuinness later this week. Queen Elizabeth once met with Idi Amin, the butcher of Africa, who is believed to have been responsible for 300,000 deaths in his native Uganda. She said nary a word at this meeting about the alleged atrocities, stories of which were circulating at the time, in 1971. Contrary to popular revisionism, Nelson Mandela was not leader of a peace loving organization called the ANC when he met Queen Elizabeth. Indeed the ANC had quite a reputation for ruthless violence at its height. Those are just two of the leaders Queen Elizabeth has met who had blood on their hands. Some would argue that Elizabeth herself, both historically and during her reign, had a fair amount of the red stuff spattered on her royal arms as well, given the many nasty colonial fights her country entered into in her name. All of which is to debunk the shrieks of horror and awe in Britain and partly in Ireland now that the Queen will meet Martin McGuinness this week. Even the Guardian that naturally Republican minded newspaper (in the British sense) newspaper had sympathy for the Queen’s plight. The Sunday Times had its usual monarchical nonsense. Their editorial stated “Grit your Teeth Maam” and said that the queen “has to do so many unpalatable things for the good of her subjects”. Don’t you love that word subjects? Not citizens? We in America fought a successful war to escape that designation. The Martin McGuinness quarrel with the Queen was quite naturally that designation and that he and 500,000 other Irish were made unwilling subjects of the Queen by the utterly unjustified partition of Ireland in 1921. That quarrel has been resolved and a fair-minded solution all around found for the present and most likely any future changes will be done peacefully. So quite naturally, as representative of his people freely elected, Martin McGuinness should meet the queen. Both McGuinness and the Queen suffered grievous losses in the years of “The Troubles”. It is a sure sign of the New Ireland that they can now meet as equals, both representing their people, though one is elected and one is not. It is nothing more dramatic or different than that – the British media notwithstanding.